The Ecological Footprint is a simple metric. It is also uniquely comprehensive. Not only does it measure humanity’s demand on our planet’s ecosystems, but it is also key to understanding the inter-related pressures of climate change on the natural ecosystems on which humanity depends. We believe that the time has never been more apt for Ecological Footprint accounting to be embraced and applied as an effective part of a comprehensive framework, that links climate to cities and countries’ competitiveness (as we spelled out in the example of Switzerland). It provides an invaluable tool to measure and track the impact of our efforts to remediate climate change, both in terms of the pressure we put on nature and of the capability of the planet to provide for these demands. The methodology behind the Ecological Footprint is the only one that links carbon emissions to all other competing human demands on nature. The Ecological Footprint answers a central question: How much nature do we have, and how much do we use? Life, including human life, competes for biologically productive areas. In fact, all productive areas for which various human demands compete can be added up. This is what the Ecological Footprint does: It measures the biologically productive area needed to provide for everything that people demand from nature: fruits and vegetables, meat, fish, wood, cotton and other fibres, as well as absorption of carbon dioxide from fossil fuel burning and space for buildings and roads. Biocapacity, on the other hand, is the productive area that can regenerate all those goods and services which people demand from nature. Comparing biocapacity to the Ecological Footprint then allows us to assess how [un]sustainable our economy is. Since area productivity varies around the world, it is measured in a standardized unit called “global hectares,” productivity-adjusted hectares. This makes areas globally comparable. For instance, if a hectare produces only x% of the world average, it is counted as x% of a global hectare. Through this accounting, all competing demands on nature (although not all environmental problems) can be compared. The same is true on the biocapacity side where the regenerative capacity of the land of any country or region can be compared against another. The carbon component of the Ecological Footprint—which we call the carbon Footprint—measures the area of forestland that is required to absorb all the carbon emissions from human activity in excess of what the oceans already absorb (the carbon Footprint can also be expressed in tonnes of CO2 emitted). Currently, the carbon Footprint makes up 60% of humanity’s Ecological Footprint. It is inextricably linked to the other components of the Ecological Footprint—cropland, grazing land, forests and productive land built over with buildings and roads—since all these demands compete for space, as mentioned above. Also consider: Two hundred years ago, the carbon Footprint was essentially zero. To reach the 2°C climate change target stipulated by the Paris Agreement, the carbon Footprint worldwide has to be zero well before 2050, and even earlier with a 1.5°C target. 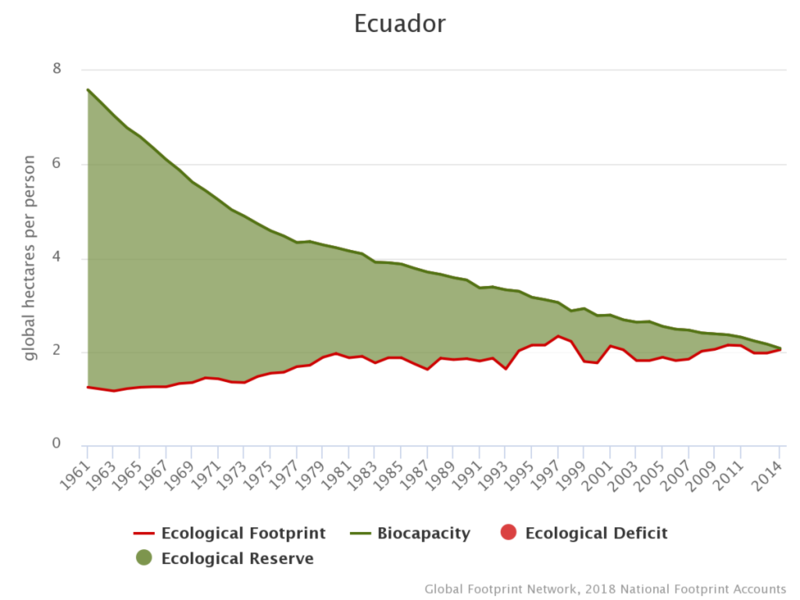 Recognizing their own risk exposure, Ecuador included the goal to avoid sliding into ecological deficit in its national development plan, starting 2009. This is particularly interesting, because Ecuador was classified as an ” Annex II” country according to the Kyoto Protocol, exempting them from taking climate action. One of the most biologically diverse countries in the world, Ecuador was once a place where natural wealth vastly exceeded what the population demanded to support its activities and absorb its CO2 emissions. Today, that biocapacity reserve has all but evaporated. Biocapacity per person dropped from 7.6 global hectares in 1961 to 2.1 global hectares in 2014. One big driver behind the 73% loss in per person biocapacity is the 240% increase in population over the 1961 to 2015 period. In 1961 (the earliest year UN data is available), the carbon Footprint of Ecuador was barely 10 percent of its overall Footprint. By today, it has grown nine-fold, on a per-person basis, and makes up more than half of Ecuador’s total Footprint. For details visit the downloadable Data Package. “We asked, in guaranteeing the rights of Mother Earth, what would be the most comprehensive indicators we could have? The Ecological Footprint brings together multiple factors that support preserving natural wealth and recognize the impacts that consumption and development patterns have on different areas,” Dania Quirola Suarez, an environment adviser in Ecuador, said at the time of the project. Forestlands and croplands also affect each other. Forests make up one of our most crucial ecological assets given the fact that the carbon Footprint combined with demand for forest products (paper, timber, etc.) make up a whopping 70 percent of humanity’s Ecological Footprint. Even if the whole Earth were covered with forests (which we do not advocate), we still wouldn’t have enough forestlands to meet our current demand for products and services from forests. Obviously covering the world with forests is not the answer, particularly considering that some areas are also need to grow edible crops for the 7.6 billion of us. Again, take Ecuador: The country has lost about one-quarter of its forest biocapacity since 1961, while cropland and grazing land biocapacity have more than doubled. Mapping the world, a country, or even a city’s Ecological Footprint—its material and energy dependence on biocapacity—provides a comprehensive view of the competing material demands on our planet as the world economy tackles climate change and weans itself off fossil fuels. 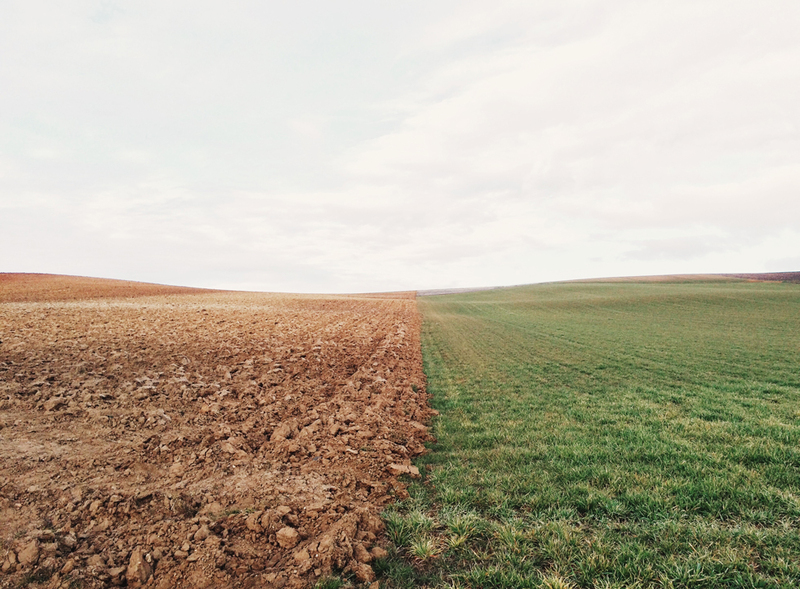 For example, one of the challenges of climate change is how to reduce CO2 emissions without putting more pressure on the rest of the biosphere, for instance by increasing agrofuel production. Such a shift would not only add pressure on ecosystems but could also have significant social impact if such biofuel production competes with food crops. This underlines why a comprehensive approach is needed in order to succeed with the transformation to a carbon-free economy. With all the available climate science, it becomes obvious, that the only viable path forward is an economy that lives off our planet’s regeneration, rather than its liquidation. The choice is merely how fast we get out of liquidating fossil fuels and with it Earth’s climate stability. We can go faster and comply with Paris, thereby rescuing much of our precious biocapacity (this means ceasing fossil fuel use well before 2050). Or we can go slower, still having to eventually move out of fossil fuel use, but then being left with less, and less reliable, biocapacity. Either way, it becomes clear that climate action is a question of resource security. In other words, if your city or your country is not getting ready for the inevitable future, your city or country will not be ready for that future. And that would not be pretty. It is that simple. There is no benefit in painting yourself into a corner by continuing expanding resource dependent infrastructure and resource-intensive economic sectors. We are not stuck in a “Tragedy of the Commons” – rather we are stuck in the belief that we are trapped in such a “Tragedy of the Commons,” thereby waiting unnecessarily for others to act first. What are you waiting for? More on Footprint, biocapacity and climate you can find here.